The Skinnygirl Cosmo requires no mixing. This drink is simply poured out of the bottle into your favorite cocktail glass. I have been following the Skinnygirl alcohol for a while. A couple of years ago, I wrote a Skinnygirl red wine review in which I advocated for not drinking the stuff. 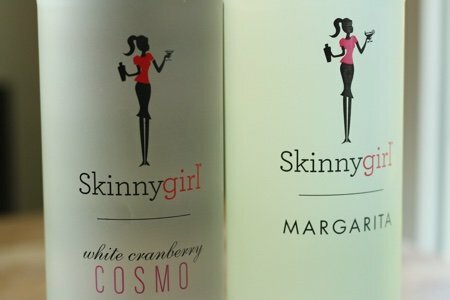 This time, I thought I would take a look at the Skinnygirl White Cranberry Cosmopolitan and the Skinnygirl Margarita and see if they were a good idea for those of us who love a cocktail but hate the calories. Right away, I was concerned with the white cranberry Cosmo because it lacked the lovely pink color that I associate with a regular Cosmo. Did you even know there was such a thing as white cranberry juice? It exists!! The white berries are picked a few weeks earlier than the red ones. The bottle set me back $13 and the drink is almost 10% alcohol. Wine is on average between 8-14% alcohol so think of it as like buying a bottle of wine. My cocktail glass (see below) holds about 5 ounces. 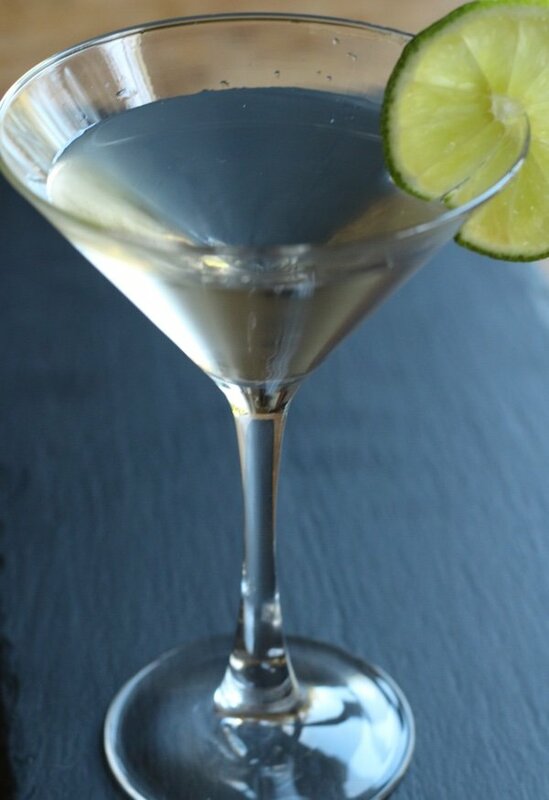 The Skinnygirl Cosmo is made with vodka, triple sec and natural flavors and says it is 34 calories for 1.5 ounces. That means a drink in my glass is 113 calories – which is pretty low for a cocktail of this type. 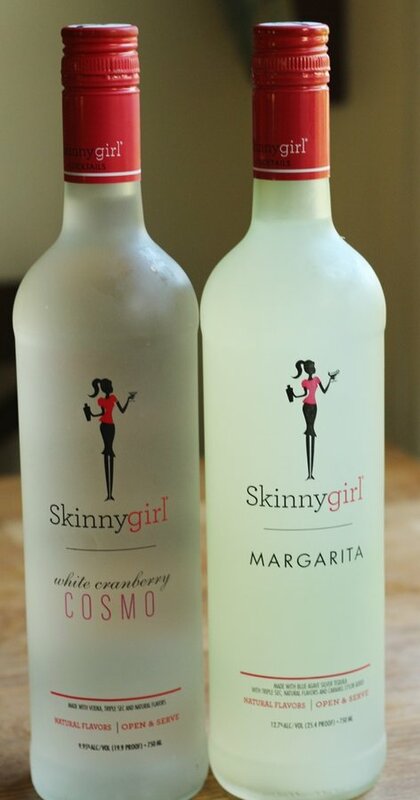 A regular cosmo would probably set you back about 212 calories so the Skinnygirl is keeping you skinny. This drink has less alcohol (and sugar) than the regular version. How did it taste? I can tell you that I didn’t like it AT ALL. I have had my share of Cosmos and this did not compare. It had a bitter aftertaste that I couldn’t get rid of. I think they might be using stevia to help keep the calories down (as well as adding less alcohol). I would avoid this product. I happen to really love margaritas (maybe a bit too much). I was excited to give this a try. 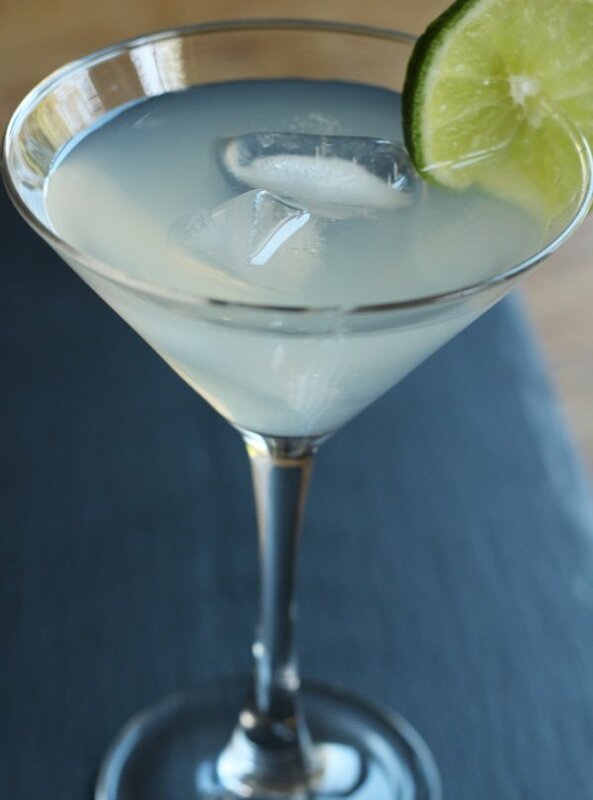 The Skinnygirl margarita is made with blue agave silver tequila, triple sec, natural flavors and caramel color and will set you back 124 calories for a 5 ounce serving. I make my own version of a lighter margarita and it sets me back about 158 calories. Guess which one I like better? Again, there is a bitter aftertaste (yuck!) and I missed the taste of fresh lime juice. This drink is okay and better than the Skinnygirl cosmo but I still would rather have my own lighter margarita. Mixed drinks are hard to make lighter because they typically have sweet juice added. My favorite light drink remains sparkling wine. At 90 calories per glass with all those bubbles – how can you go wrong? For the teenagers who read this site, Snack Girl advocates waiting until the legal drinking age to indulge in alcoholic beverages. After trying her wine and tossing it I don't think I would try any of her other products. Thanks for your review. Now I won't be tempted. Not only are these drinks terrible but I find the marketing deplorable. It insinuates that women somehow need to be buying dumbed down liquor in an effort to maintain an unrealistic and unhealthy body size. Ugh! Glad you weren't supporting it. Would you mind posting your lighter margarita recipe? Michelle--on my screen her lighter margarita mentioned above was a link...which took you to the recipe. It should show as blue which is a link. Have you tried the new weight watchers wine?